The sludge samplers are ideal for sewage treatment plants, chemical plants, and food processing facilities - anywhere that accurate sample levels of settled solids in non-caustic materials are needed. The sludge sampler holds approximately 3 oz. per foot (89 ml per 0.31 m). The Sludge Judge® comes in 5 ft (1.53 m) sections of 3/4 inch (1.90 cm) plastic pipe with screw-type connectors. The top section of the sludge samplers include a nylon rope for raising and lowering the sampler. Individual sludge sampler sections can be combined as required to achieve the length needed. Among the sludge sampler's accessories is a convenient canvas carrying case that holds up to four sections, cleaning brush, cleaning rod, and cotton strips. NOTES: Do not use in liquids over 165° F (74° C). The Sludge Judge® is not autoclavable. Sludge Judge® Ultra For maximum strength and rigidity - use the Sludge Judge® Ultra! The sludge sampler is constructed of extremely strong polycarbonate and treated with an ultraviolet stabilizer to help reduce deterioration from the sun's harmful rays. The material is very rigid, minimizing bending of the sludge sampler when it is full of water or other liquids. The Sludge Judge® Ultra are durable in cold temperatures and can withstand heat up to 280° F (138° C) (with careful handling). 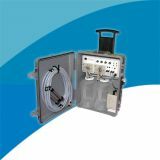 The 3/4 inch (1.9 cm) diameter tubing is marked with blue tape to designate 1 ft (0.31 m) measurements on the sludge sampler's tubing. The sludge samplers are made up of three 5 ft (1.53 m) sections (top, extension, bottom). Individual sludge sampler sections can be combined as required. Sludge Judge® Ultra is not autoclavable. 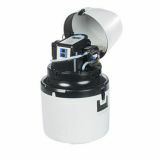 The carrying case and cleaning brush for the original Sludge Judge may be used with this unit. 1. Slowly lower the Sludge Judge® to the bottom of the tank. A. The sludge sampler's float valve opens, allowing materials to flow in. 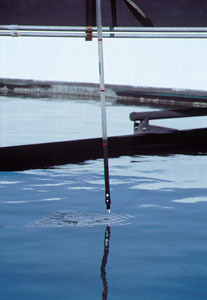 When the bottom has been reached and the pipe has filled to the surface level, tug slightly on the rope as the unit is raised. B. This sets the sludge sampler's check valve, trapping the mixture inside. 2. When the sludge sampler has been raised clear of the liquid, the amount of solids in the sample can be read using the 1 ft., 0.31 m increments marked on the pipe sections. 3. To release the material in the sludge sampler, touch the pin extending from the bottom section against a hard surface. This opens the sludge sampler's check valve to drain the sample.